The editor and publisher of The Jena Times wrote this week that he and his son stopped giving interviews to national news media after the British Broadcasting Corp. "twisted everything that was said to make us look like fools" and an unnamed U.S. news outlet's report of a later interview "was twisted to the point that we did not even recognize it." For the paper's advance story on the protest, its report on recent court action involving one of the Jena Six, and its chronology of events, click here. Franklin's son, Assistant Editor Craig Franklin, wrote in his column, "Lost in all of the racial headlines is the fact that the school, despite all the distractions it has faced in the past year, managed to exceed all projections for academic growth and is listed with the highest academic rating that a school can achieve." (Read more) For a balanced and comprehensive profile of Jena, from Todd Lewan of The Associated Press, click here. For an update of events since Thursday, from Abbey Brown of The Town Talk, the daily paper in nearby Alexandria, click here. UPDATE: For an interview with Paul Carty, executive editor of The Town Talk, by Al Tompkins of The Poynter Institute, click here. More farming in East needed to counter risks of demand for water in West and ethanol belt? More U.S. agriculture needs to return to the eastern half of the country to head off two big challenges facing the nation -- increasing demand for water for ethanol production in the Upper Midwest and for development in the increasingly arid but still-growing West, two atmospheric scientists write in today's New York Times. "Returning agricultural production to the Eastern United States under irrigation would be efficient and environmentally sound," write Richard McNider and John Christy of the University of Alabama-Huntsville. 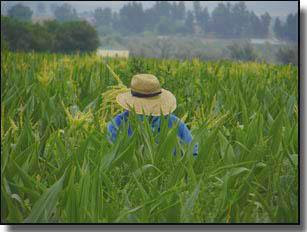 "In the West, at least three to four feet of water per acre is needed every year to produce a good crop. In the East, only a few inches of irrigated water per acre are needed, because of the region’s heavier rainfall." Three environmental groups have filed a petition with the U.S. Environmental Protection Agency arguing that Iowa officials have failed for three decades to enforce rules limiting water pollution from the hog industry, and thus should no longer be allowed to enforce federal laws and regulations upon the industry. 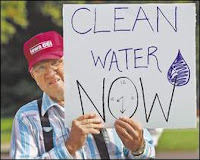 Department Director Richard Leopold told the Register's Perry Beeman, ""I do not think we are doing things that are in violation of the Clean Water Act. We are talking about interpretations." Department spokesman Kevin Baskins told The Associated Press that the agency "has been particularly diligent to try to cope with an industry that has grown by leaps and bounds." Methamphetamine use has fallen 66 percent among high school students and 70 percent among adults in Montana over the past few years, reports The Billings Gazette. Citing state surveys, Jennifer McKee and Noelle Straub report that 4.6 percent of high school students used meth at least once last year, a drop from 13 percent in 1999. That news, coupled with the 70 percent drop in adult use of meth over the past two years, has leaders praising The Montana Meth Project and its gritty ad campaign, McKee and Straub write. The results have been "more significant than any prevention effort in history," project founder Thomas Siebel said at a Washington news conference with Montana's congressional delegation. In the last two years, Montana has gone from fifth nationally in per-capita meth use to 39th, and its meth-related crime rate has fallen by 53 percent. Meanwhile, adult meth use increased by 6 percent in Wyoming and 8 percent in South Dakota over the last two years. The plan "will look a lot like that offered by many other American companies, but with some twists that even longtime critics described as innovative," writes Michael Barbaro. As the nation's largest private employer — and a key fixture in rural America — Wal-Mart had drawn criticism for the health plans it offered employees. 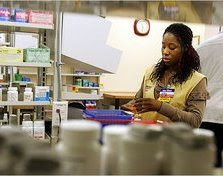 The new plan features premiums as low as $5 per month and makes 2,400 generic drugs available at $4 a prescription. 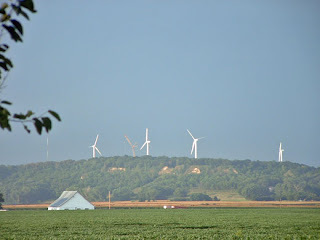 In northwest Missouri, the Bluegrass Ridge Wind Farm (in a photo by Richard Oswald for the Daily Yonder) became a reality thanks to the cooperation of local landowners, reports Brownfield Network. The push to create this wind farm, the state's first, began with Tom Carnahan, the son of former Missouri Sen. Jean Carnahan and the late Gov. Mel Carnahan. But he told Brownfield's Julie Harker that nothing could have happened without local support. "Getting the landowners in the community, their support and involvement is key," Carnahan said. "It doesn't matter how good your wind is, if a community doesn't want a wind farm there, there's not gonna be one." In the 1990s, the population of many rural counties rose because of in-migration and natural increase (more births than deaths). But in this decade, more rural counties' populations are declining because some are seeing a reversal in both those trends. Nearly 500 rural counties' populations are falling due to both outmigration and as the death rate overtakes the birth rate, reports the Daily Yonder. U.S. Mine Safety and Health Administration inspectors had gone more than five months without doing a complete review of safety at a coal mine in Logan County, West Virginia, where a worker died on Sunday, reports Ken Ward Jr. of The Charleston Gazette. MSHA must perform a "complete inspection of every underground coal mine once per quarter," but inspectors had missed those inspections in the last two quarters at the Mountaineer II Mine of Arch Coal Inc., Ward reports. On Sunday, Robert D. Fraley, 53, died after he fell about 350 feet down an airshaft that was under construction. This was the second time in September that a miner died in a West Virginia mine where inspections had been missed. It also was the second fatal shaft-construction accident nationally in the last six weeks. MSHA reports that shaft construction has the highest accident rates of all coal-ming work. Citing an increase in overdose deaths from OxyContin last year, officials in Pike County, Ky., are planning to join other Kentucky counties in suing the company that makes the drug, reports the Appalachian News-Express of Pikeville. Officials had considered a suit since June, and this week the county hired a local law firm to represent it, Loretta Tackett reports. In July, in federal court in Virginia, Purdue Pharma L.P. of Stamford, Conn., accepted a $600 million fine and three of its managers agreed to pay $34.5 million for misleading the public about the painkiller’s addictive qualities. With a new Democratic majority in Congress, the mining industry has been challenged like never before, writes Jim Snyder of The Hill. As Democrats have pushed for new mining regulations, the industry has responded by stepping up its lobbying efforts and by sending more contributions to the Democrats, Snyder writes. While the National Mining Association's two political action committees gave about 90 percent of contributions to Republicans in recent years, by the end of 2008 40 percent will go to Democrats. “We need to broaden our support on the Hill,” Kraig Naasz, the NMA's president and chief executive, told Snyder. Under the Republican majority, the industry had gained subsidies for "clean coal" in the 2005 energy bill, but now it faces increased pressure to improve safety from Reps. George Miller, D-Calif., and Rep. Nick Rahall, D-W.Va. Their bill would force the industry to speed its implementation of the safety measures Congress mandated after the Sago mine disaster in West Virginia in January 2006. Rahall is also working to reform the Hardock Mining Law of 1872, to make mines pay higher royalties. Despite years of horror stories about the dangers of using methamphetamine, it remains a major problems in parts of rural America -- and one in three youths aged 12 to 17 "sees little or no risk in trying the illegal drug," says Gannett News Service, reporting on the "first-ever national use and attitudes survey about the drug." The survey of 2,602 students found that almost a fourth think "meth 'makes you feel euphoric or happy' or helps you lose weight, and the same number said it would be 'very' or 'somewhat easy' to obtain meth," Pamela Brogan writes. "About one in six youths has either a friend or a family member who has used or been treated for meth addiction, the survey found. . . . And yet, in a finding that might be of comfort to parents, three out of four youths said they are strongly opposed to using meth." Of the 300 or so attendance, most were wearing green "Cliffside Yes" stickers, Brooks reports. These stickers dominated the few saying "No excuse for coal" worn by those opposing the expansion. "The perception has grown that the majority opposed the expansion," Duke Energy's President and CEO Jim Turner told Brooks. "I think it’s a great show of community support." Of the few speaking against the expansion, all but one came from counties other than Cleveland and Rutherford. Those in favor mostly were local leaders, who claimed their constituents were almost unanimously in favor of the plan. They also emphasized that the construction create as many as 2,000 jobs and that the plant near the Broad River would add 20 to 30 permanent positions. Bruce Henderson of The Charlotte Observer reports that the environmentalists speaking against the plan emphasized that coal-fired plants contribute to irritating ozone. He added that the South "accounts for about 40 percent of U.S. emissions of carbon dioxide, which most scientists say is warming the planet." Dr. Richard Fireman, a physician from Mars Hill, north of Asheville, said the expansion would be "a death sentence for our state." When New Hampshire Agriculture Commissioner Steve Taylor retires next month, we will miss his writing for the Weekly Market Bulletin of the state Department of Agriculture, Markets and Food. Steve was once a journalist, so he still has a nose for a good story, and the skill to tell it, so the Bulletin is one of the newsier and well-written publications of any state farm agency. The latest example of that is Steve's item in the latest Bulletin about corn mazes, the labyrinths that are chopped through cornfields to provide entertainment for "agri-tourists" and extra income for the farmers. "New Hampshire’s largest and most intricate corn maze opens for fall fun this weekend in East Conway," Steve writes. "The corn-maze craze has spread all over the U.S. over the past few years, and the Sherman Farm’s layout in the Mount Washington Valley expects to draw visitors from throughout New Hampshire and Maine. It covers over eight acres, and contains more than three miles’ worth of twists, turns and decision points. The correct pathway can be walked in about 15 minutes, but its designer, Brett Herbst, figures it will take most people at least an hour." In this year's second quarter, Sen. Barack Obama, D-Ill., received $861,646 in campaign contributions from rural residents, the most collected by any candidate, according to Daily Yonder analysis. 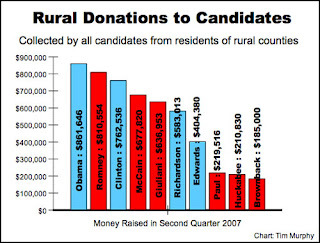 Republican Mitt Romney came closest to Obama's total with $810,554 in rural contributions. Obama had almost twice as many rural contributors as did Sen Hillary Clinton, D-N.Y., but her rural givers wrote bigger checks, giving her a rural total of $762,536, not far behind Obama's. 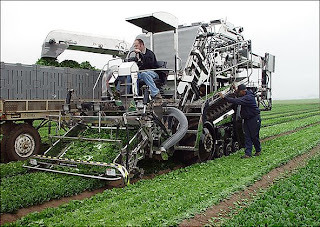 Machines have been used in the past with crops such as tomatoes and low-grade wine grapes and nuts, but fresh produce demands more advanced machines than those in the fields today. But with imaging technology that allows farmers to map an orchard coupled with improvements in hydraulics, the newest machines are beginning to replicate the movements of a manual laborer. "The technology is maturing just at the right time to allow us to do this kind of work economically," Derek Morikawa, whose Vision Robotics has been to develop a fruit picker, told Adelman. Still, the machines are not ready for consumer use, and when they are, they likely will cost $500,000 each. As more homes have risen in wild areas of the Sierra Nevada, there are increased risks for wildfire, and taxpayers are paying for it, reports the San Francisco Chronicle. 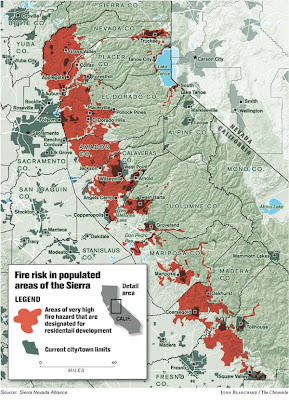 A two-year study by the Sierra Nevada Alliance shows that this "rural sprawl" has moved into fire danger areas,the communities, Peter Fimrite reports. As a result, many communities "cannot afford to maintain roads, build new infrastructure and pay for the fire protection necessary to keep up with the growth," he writes. The Sierra Nevada is California's third-fastest growing region; 88,000 people moved there between 1990 and 2000. And now 94 percent of new development there is within fire-prone areas, the alliance's report says. "The more development you have the more challenges you have," Rex Norman, spokesman for the Lake Tahoe basin management unit of the U.S. Forest Service, told Fimrite. "As an agency we don't get into private property issues, but we are a participant in the concern, mainly with regard to the resources that people need for fire protection and the work people need to do to prevent fire." After grand plans and a promising start, a South Dakota building designed to be an American Indian cultural facility and judicial center remains incomplete as its federal funding has been cut off, reports The New York Times. 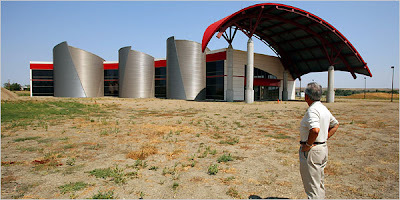 Monica Davey writes that the Wakpa Sica Reconciliation Place (pictured in a Times photo by Keith Bedford) was meant to help lure outside investment to the reservation "by creating a court system where outsiders could recoup losses if a business deal went bad." Former Sen. Tom Daschle, D-S.D., had led the push for a federal earmark for the $18 million project, but with the loss of his re-election bid in 2004 and the anti-earmark tide sparked by the Jack Abramoff scandal, the project lies half-finished, Davey writes. The project's budget also has ballooned to $25 million, and so the building's eagle-inspired design has just one wing. 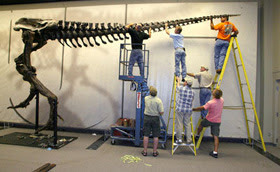 As the Anniston Museum of Natural History in Alabama prepares to unveil its biggest visitor, a Tyrannosaurus rex skeleton, The Anniston Star has found some creative ways to cover the upcoming exhibit, "A T. Rex Named Sue" (pictured at left in a photo by Trent Penny). The newspaper has a special section set for Saturday, Sept. 20, the same day the exhibit opens to the public, but is using its Web site and accompanying blogs to offer information in the meantime. The paper has devoted a section of its main site to coverage of the exhibit as well as links to more information about dinosaurs. On the "Behind the Star" blog, there are some funny video trailers made by staffers to promote the arrival of Sue. To view them, go here and here. In total, the Star has 12 blogs devoted to various subjects, from education to high school sports. Fatal drug overdoses killed 264 people in western Virginia in 2006, a 22 percent increase from last year, reports Laurence Hammack of The Roanoke Times. Those deaths accounted for 40 percent of the state's drug overdoses, even though the region has just 20 percent of the state's population. The 2006 total also represented a 294 percent increase from a decade ago, as prescription drug abuse has become a "public health epidemic," Dr. Martha Wunsch told Hammack. In recent years, however, federal prosecution had targeted OxyContin and its marketing, and the number of fatal overdoses had stopped climbing between 2003 and 2005, Hammack reports. "Back in the heyday of OxyContin, it had really gotten bad," Richard Stallard, head of the Southwest Virginia Drug Task Force, told Hammack. "But right now, it is the worst I've ever seen it." Since the White House vowed to curtail illegal immigration, farmers have been worrying about what could happen when the administration makes good on that promise, writes Sean Ellis of the Idaho Farm Bureau Federation, which provided the photo of a worker in a cornfield. That crackdown could arrive in time for this harvest, which could mean an inconvenience or worse for farms that depend on immigrant labor. Ellis adds that law enforcement will be focusing on those businesses that employ illegal aliens. If that happens, then "the food chain could start falling apart," one California producer told Ellis. The first sign of trouble will be the arrival of a "no-match" letter from the Social Security Administration, which notifies a business about a problem with employees' Social Security Numbers. The business can then either fix the problem with the SSA or fire the employees. If the employee remains on the job and is found to be illegal, the business could "face fines or criminal sanctions," Ellis writes. Since the start of the 2007 fiscal year, there have been 742 criminal arrests of employers. With no guest-worker plan in place, many farmers say the enforcement could leave them shorthanded. “If we go cold turkey, it could create some real disruptions,” Duffin told Ellis. “We obviously do need the workers here. But we need to know who they are and have them here legally and the system isn’t working now.” (Read more) To view the Department of Homeland Security's information on immigration, go here. Venture-capital funds and other investors recently put millions of dollars into SunEthanol, a biofuels technology company in Amherst, Mass., that is working with a bacterium that converts all sorts of plant matter, including cellulose, into ethanol. The company is using research by University of Massachusetts Amherst microbiologist Susan Leschine, who has made it the focus of her work for the past decade and is the chief scientist at SunEthanol. “The Q microbe . . . is highly efficient at converting biomass to ethanol. And it does so in a carbon-neutral process that doesn’t require the additional enzyme treatments usually accompanying bioethanol production," says Newswise, a research-reporting service. "The microbe’s enzymes are another property that makes it an ideal organism for use in large-scale production of ethanol from biomass. Usually, cellulosic ethanol production involves several steps: pre-treat the plant material mechanically or chemically to get rough biomass; treat rough biomass with enzymes that have been bought or made in a lab; add the fermenting organism; recover and purify the ethanol. But the Q microbe’s own enzymes are more than sufficient, eliminating a costly step and consolidating production into one tank. Low estimates are that this consolidated production reduces costs by 25 percent, says Leschine." As the ethanol industry gains momentum nationally, various farm lobbies find themselves battling over ways to slow or speed its growth, reports The Associated Press. Christopher Leonard explains that as corn farmers and their lobbyists push for more government subsidies for ethanol production, meat and dairy farmers and their lobbyists seek the opposite. With Congress considering new fuel standards that could bring production of renewable fuels to 36 billion gallons by 2022, the future of the biofuels industry could be determined by the "food fight shaping up between grain producers and livestock lobbyists," Leonard writes. "It's very true that the agricultural lobby will speak with a louder voice if it's saying the same thing. In that sense, it's been a less united voice than it has in the past," Pat Westhoff, an economist with the Food and Agricultural Policy Research Institute at the University of Missouri, told Leonard. This decade is the first in which more people in the world are employed in service jobs than in agriculture. A study by the International Labor Organization found that in 2006, 42 percent of the world's workers were in the service sector, while agriculture employed 36.1 percent. The industrial sector accounted for 21.9 percent, unchanged over the last decade. Agriculture, which was arguably the world's first form of employment (after hunting and gathering), is still the top employer in the world's poorest regions, the report adds. As China's demand for coal has begun to outpace its supply, other international markets are turning to the United States for coal, reports Matthew Dalton of Dow Jones Newswires. As China opens another coal-burning plant almost every week, it is importing more coal from Australia and South Africa. These markets normally serve Europe, and so consumers there will now rely on U.S. coal. Companies producing coal used in making steel will see benefits first, especially because two major metallurgical coal mines have been shut down temporarily, Dalton reports. Most U.S. coal is used to make steam in domestic power plants, but as much as 58 million tons of both steam and metallurgical coal will be exported in 2007, which would be an 18 percent increase from the 49 million tons exported in 2006. As demand for both types grows, utilities' stockpiles of coal should dwindle. "It's not affecting us yet," Deborah Rouse, manager of coal and transportation at Southern Co., one of the nation's largest coal consumers, told Dalton. "It's not affecting the U.S. market yet because of the inventory hangover. ... If the export demand continues, and domestic demand picks back up, then I think that just has upwards price pressure on the market." According to a study sponsored by the John S. and James L. Knight Foundation, a majority of high school students do not know about Constitution Day, the anniversary of the document's adoption and the day American students are legally required to learn about it, The Associated Press reports. Today is Constitution Day, the anniversary of the completion of the document in 1787. The study reports that 51 percent of high school students did not know about Constitution Day, and just one in 10 remembered how his high school observed the day last year. Led by Sen. Robert Byrd, D-W.Va., Congress created the day in 2004 with a law requiring every school that receives federal money to teach its students about the Constitution on or around Sept. 17. Eric Newton, Knight Foundation journalism-program vice president, told AP he worries that today's students lack an understanding of their nation's democracy. "We're concerned that teaching to the test and the emphasis on math and science is hurting the American civics education," he said. AP reports that the study also found that 68 percent of students had taken a class related to the First Amendment, up from the with 58 percent who said they had in 2004. For the full report, go here. Education initiatives are seeking to improve learning by putting the latest technology in students' hands. Rachael King of Business Week reports on a few of these programs, which make use of iPods, laptops and the Internet to help rural students stay up to date with their peers. 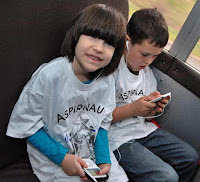 Photo by King shows students using iPods on a school bus in a pilot program of the Aspirnaut Initiative in Grapevine, Ark., which has transformed the bus into a second classroom for the children who spend 15 hours a week riding it, she reports. The initiative has brought wireless Internet to the bus and given each of the children laptops or iPods so they can keep the long commutes from being lost time. That program was started by Billy Hudson, a Vanderbilt University biochemistry professor and Grapevine native, who wanted rural children to be prepared for today's economy. "People are seeing in rural areas that the jobs they know about are being outsourced," he told King. A school in Mobile, Ala., is also using the Web to help its students experience a world beyond their community. There, students were struggling to learn vocabulary because words such as "trampoline" were totally outside their frame of reference. To address this, the class has begun taking field trips and recording them on podcasts and blogs, so that the information is available to all in the school for future reference. In many of the examples King cites the money for the programs came from grants sought by the schools and came from companies such as Apple and Microsoft. With the introduction of more technology in the classroom, King writes, there came the need for specific guidelines to keep the tools from becoming distractions or even threats. The guiding rule is usually this: The students use them correctly or lose them. Several media outlets have reported on an ammunition shortage facing police departments, and many pointed to the fighting in Iraq as the main culprit. However, National Public Radio reported that rising prices and demand have come from increases in copper. Regardless of the cause, the spike in prices has hit recreational shooters as well, and The Daily Courier of Prescott, Ariz., reports on how they are dealing with it. Jason Soifer writes that shooters are shunning commercial bullets in favor of cutting costs by making their own. Soifer writes that for about $800, a shooter can buy reloading equipment and “recoup that money in about a year” in saved bullet costs. For other recreational shooters, the only choice is to reduce the number of bullets they use. After decades of decline in the incidence of black lung, the coal miners' disease is on the rise, The Charleston Gazette reports. Ken Ward Jr. writes that a new study by the National Institute for Occupational Safety and Health shows the rate of black lung has doubled since 1997. According to the study, 9 percent of miners with 25 or more years working underground show signs of black lung, up from 4 percent 10 years ago. Since NIOSH began its X-ray studies of miners' lungs in 1970, until the late 1990s, black lung rates had been steadily declining. A 2006 study from the Centers for Disease Control reported areas in Southwest Virginia and Eastern Kentucky where cases of black lung were sharply increasing, Ward writes.